Before you make any transaction, it is important that you first perform your organisational setup. The initial organisational setup consists of several stages that you have to go through to ensure your organization is configured properly. 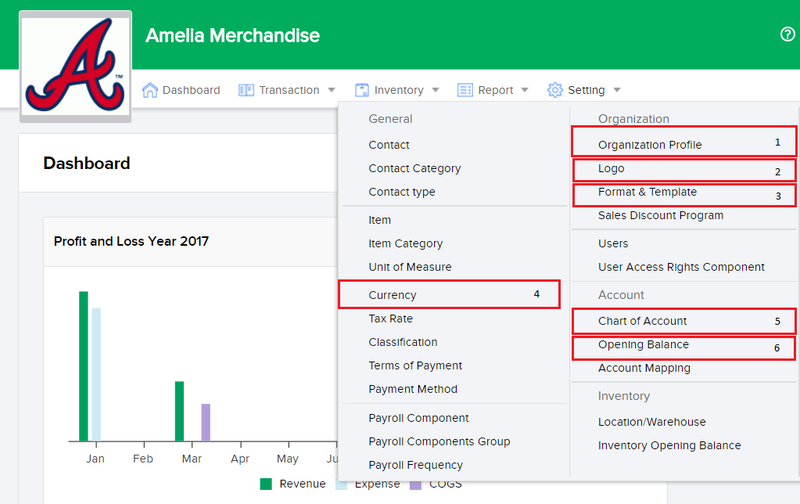 The Sleekr Accounting initial setup stage consist of of 6 stages: Organizational Profile, Logo Setup, Invoice Setup, Currency Setup, Chart of Account Setup and Inventory Opening Balance Setup. Learn how to setup your organization Profile in full here. This phase enables you to upload or change the logo/emblem of your organization. Learn how to upload or change the your company logo and invoice logo here. Learn how to change your company's invoice settings here. This phase enables you to determine and manage currencies used for your business transactions. Learn how to manage your company's currency and exchange rate preferences here. This phase enables you to manage the structure of your Chart of Accounts/COA in accordance to your company's needs and preferences. Sleekr Accounting automatically provide a standard template with core accounts which you can use. In addition to that, you will be able to add, erase and edit in accordance to your preferences. There are a few accounts which you will not be able to erase: those are accounts with a lock symbol to their right - these accounts mandatory in the Sleekr Accounting system. This option enables you to be able to erase an account your business no longer requires in your chart of accounts. Learn to erase an account from your chart of accounts (COA) here. This option enables you to edit an account to adjust your existing account to your company's needs and preferences. Learn to make amendments to an account in your chart of accounts here. Learn to add an account to your chart of accounts here. This phase enables you to input or make adjustments to your company's opening account balance. Saldo awal adalah angka/nominal yang dimiliki pertama kali untuk melakukan sebuah usaha dalam neraca. Learn to input or make adjustments to your company's opening balance here.